After aspiring professional skier Roy Tuscany had an accident that left him paralyzed from the waist down, his community flooded him with financial and emotional support. After years of various forms of treatment, Roy Tuscany defied medical odds when he stood up and walked out of the hospital. Following his astonishing recovery, he made it his mission to "pay-it-forward" with the creation of The High Fives Non-Profit Foundation: a provider of resources and inspiration for athletes with life-altering injuries. When I was paralyzed, I had to lean on my friends and family for donations. Thanks to them, I was able to focus entirely on walking again at the best rehab facility," Tuscany explains. "Many injured athletes don't have the same resources that I had. That's why I created the High Fives Foundation. Our support offers grants for procedures and treatments not covered by insurance. We also provide an established community with a recovery gym in Truckee, California, that's available for their use." According to Tuscany, the 2,500-square foot High Fives Foundation facility serves as a space for hope, rejuvenation and progress; so it's critical that the facility is energizing, exciting, and above all, easy to navigate. To create an engaging and easy-to-use space for athletes to exercise, he consulted in Lake Tahoe-based technology integration firm Epic AV Automation to upgrade their outdated A/V system with new equipment and user-friendly automation. "We met with Roy after we saw what Core Brands was doing for the Gary Sinise Foundation. I wanted to give back to the community and help those in need. After meeting with Roy and some of the High Fives athletes I knew this was a fantastic organization and Epic AV Automation has an opportunity to actually help change the lives of the adaptive athletes on a daily basis," Epic AV Automation President and CEO Scott Ruzich said. "We knew pretty immediately that the ELAN Entertainment & Control System would serve as the perfect central hub for the facility. It's user-friendly and offers extensive control. With one ELAN Controller, both the staff and the athletes are able to control audio, video, lighting, security, and climate at the touch of a button. It personalizes the experience for everyone." To operate and manage the facility remotely, Tuscany had each employee install the ELAN App on their smartphone. "It's really helpful and convenient for the staff to be able to control the space remotely," Tuscany said. "Our on-site physical therapists can turn on the heat in their rooms an hour before they arrive for their first session. They can also turn on the lights in the morning from their cars. Not only is it helpful for the athletes, but it is a game-changer for our staff." Tuscany encourages each recovering athlete to download the ELAN App on their smartphones as well, so that the control is as simple as reaching into their own pockets. 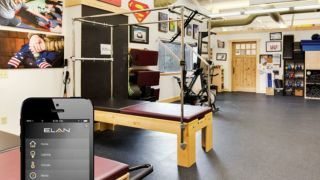 Now, they have a way to manage the audio, video, temperature and lighting within the gym without interrupting their exercise to request a change. "It's awesome for athletes to be able to control the music or the video in the area that they are working out in," Tuscany said. "Music can be a real motivator. It is a huge part of the recovery process and I'm so happy to be able to give them that control." With an existing audio system on-site running entirely off one receiver, EpicAV Client Relations/ System Design Manager Russ Carlsen and his team used ELAN to extend it to include four separate zones, which encompass the facility's recovery gym, juice bar, physical therapy rooms, and the office space. Since the High Fives Foundation offices share the same floor as the actual gym, it was important that the music playing in the workout facility was different than the music playing in the office space. "By creating different zones, I was able to successfully separate the office environment from the recovery gym," Carlsen added. To guarantee total control of the televisions, Carlsen and his team also revamped, upgraded, and expanded the gym's video system. Carlsen installed three additional flat panel TVs with an Apple TV console, all of which are controlled by ELAN. "An athlete can use the ELAN App to change what's on the television they are watching," he added. Carlsen also installed several security cameras and integrated them into the ELAN system so that Tuscany can check on the facility remotely. It enables them to manage and view camera feeds and ensure that the facility is safe and sound at all times. "We installed multiple surveillance cameras and hooked them up to the ELAN App," he added. "Roy doesn't have to be physically at the gym to see that everything is going smoothly!" In addition to outfitting the recovery gym with control, The High Fives Foundation has commissioned the Epic AV Automation team to install an ELAN Entertainment & Control System within a handful of athlete's homes to help improve their quality of life. ?Home automation provides accessibility that is taken away with a physically impairing injury," Tuscany explained. "We want to bring this convenience into injured athletes' homes, and allow them to complete daily tasks, like turning the lights on and off, on their own." Thus far, Epic AV Automation has donated over $10,000 in labor and materials to the foundation. To experience a 3D Tour of the facility, click here.